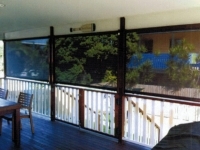 Channel guide awnings are a wonderful addition to any home. The channels and brackets are powder-coated with any standard colour to match your home or business as well as ensuring that sleek, integrated look that blends seamlessly into your home. 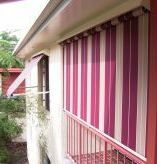 Manually operated by twisting the bottom rail to lock the awning into your desired position. The awning can lock at any position along its drop. 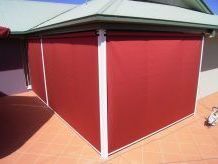 Fabric is rolled around a spring-tensioned, galvanised or aluminium tube at the top of the awning which can be altered to your desired requirements. This awning is best suited where there is a flat surface at both ends ie between verandah posts.